A few days ago, Starbucks quietly announced the launch of a “secret” seasonal drink – the Franken Frappuccino. 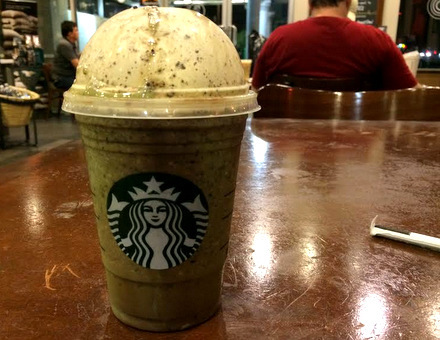 Also known as the Frankenstein Frappuccino at some stores, this drink did not appear on any regular menus and was said to be available for three days only leading up to Halloween. A quick survey of stores in my area found that some were promoting this secret drink on their chalk menu boards, while others had no signs of any kind posted about it. Whether there was a display or not, every single one knew exactly how to make it. The frappuccino is made with a green tea base, to which white chocolate mocha and peppermint syrups are added, along with java chips for color and texture. A mocha drizzle on the side of the cup gives it a creepier overall color scheme and the drink is topped with whipped cream and a mocha drizzle to finish it off. The drink has an underlying matcha flavor with a generous dash of mint chocolate chip ice cream. It’s not as sweet as you might expect, since the matcha really reins in the sweetness of the white chocolate and peppermint. The mocha drizzle and java chips were a really nice touch and the frappuccino looked perfectly Halloween-y. Despite its swamp-thing appearance, it actually tastes very good. That said, it wasn’t my absolutely favorite, but only because I am not a huge fan of matcha frappuccinos and ice blended drinks in general. If you do like matcha, this is a Halloween treat that is worth tracking down. If you want to give it a try when you head out to trick or treat tonight (10/31), the Franken Frappuccino will still be available through the end of the day. If you go after 2pm, all grande sized Frappuccinos will be only $3, which amounts to a savings of about $2.50 on the Halloween drink.